The St Austell Market House is described as the jewel in St Austell's crown, a marvellous old building dating from 1844. The building is Grade 2* listed and puts it in the top 5% of important assets in the Country. This old building is of great historical and architectural importance. The site upon which the Market House now stands was previously used as Market Place and records show that in 1791 a small market building stood on the site. 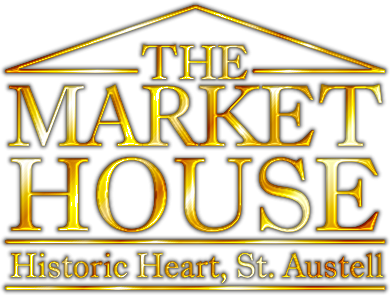 Currently the Market House is home to a number of niche retail/service outlets, hairdresser and cafe as well as housing the St Austell Old Cornwall Society Museum next door. Call in and take a look around or for more information about what you can expect to see on your visit click here. The Market House welcomes visitors all year round, Monday to Saturday. Regular events take place to join in with the towns celebrations including Santa's grotto at Christmas, the Zombie Walk on Halloween and the new found success of the Whitegold and Garden festivals held annually in St Austell Town centre. At present the Market House board of Directors are working with partner organisations and Townscape Heritage Initiatives to develop a programme of restoration and renovation. If you would like to rent one of their units please click here for more details.